Solid fiberglass poles, metal u-joints and 5mm Rukket tough netting create a strong and rigid goal sure to withstand intense games. 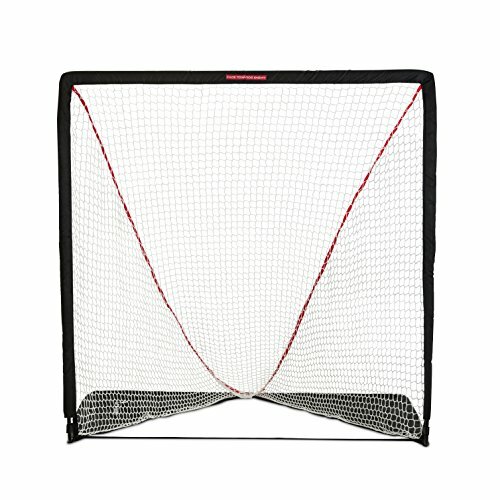 Net is made of a white heavy duty polypropylene 5mm netting with interlocked stitching. Rukket proprietary flex technology allows the goal to absorb the impact of the ball, making it exceptionally durable. Folds down in 3 motions into a flat triangle for easy transport and storage. Use indoors or outdoors, practice anytime, anywhere. Click the "ADD TO CART" button and order now! This product is backed up by our 100% SATISFACTION GUARANTEE and outstanding USA based email and phone customer service for no-risk purchasing.